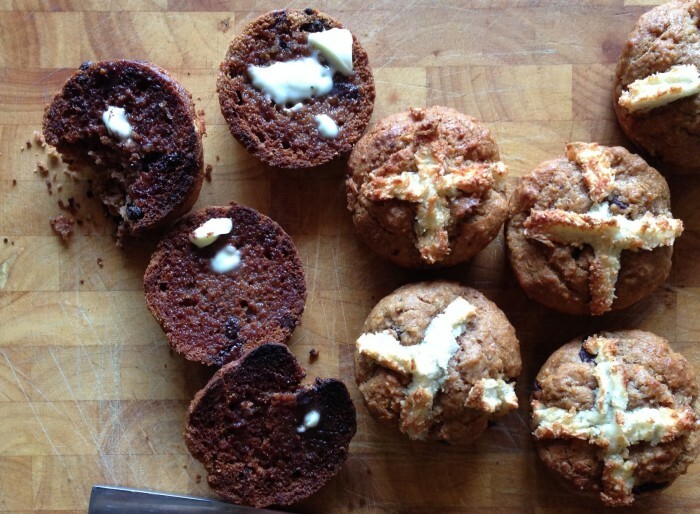 Looking for a healthy hot cross bun recipe? These nutrient-dense paleo hot cross buns will be a crowd pleaser for the family at easter. They also make a lovely Easter gift instead of the typical chocolate easter eggs. 1 1/2 cup almond meal. 1 1/2 cup arrowroot flour. 150 g grass-fed butter or 1/4 cup coconut oil, melted. 1 teaspoon finely grated orange zest. 50 g 85% dark chocolate, chopped. 1. Preheat oven to 180ºC / 350ºF. Lightly grease a 12-hole muffin tray. 2. Mix almond meal, flour, bicarbonate soda, baking powder and spices together in a bowl. 3. In a separate bowl combine eggs, butter, syrup and orange zest. Add wet mixture to dry and combine well. Fold through chocolate pieces. 4. Pour mixture into prepared tray. 5. To make crosses, whisk egg whites and desiccated coconut. Drizzle over unbaked buns in a cross shape with two spoons or using a piping bag. 6. Bake for 20-25 minutes, or until lightly golden and a skewer inserted into the centre comes out clean. 7. Best served toasted under the grill with butter. Can you cut down on the sweetness? Absolutely! We've made these without any sweetener at all and they're still super-delicious. If you're looking for more healthy Easter recipes, check out our delish Hot Cross Bun Cookies and Sugar-Free Easter Eggs.